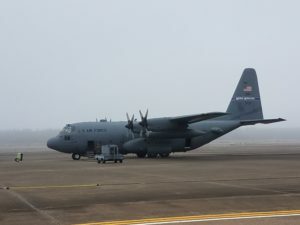 The C-130 is the chariot of choice for modern Airborne students. 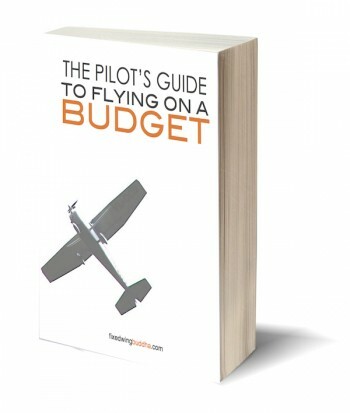 This article originally appeared on NYCAviation.com. Dropping something out of an airplane is generally frowned upon for most people because you never know where that thing you dropped is going to land or whom it might hurt. 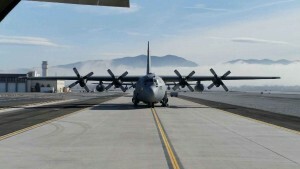 However, in the C-130, dropping things out of our airplane is what makes us different from UPS or FedEX; that, and landing on dirt strips that are only 3000 feet long. In the history of the US military, a number of significant drops really changed the face of the wars where they took place. As a member of the 50th Airlift Squadron, I am proud of the heritage that has been left to me by those who participated in those airdrops, including D-Day — probably the most famous airdrop of all. The HBO series Band of Brothers (which if you haven’t seen, I highly recommend) made that airdrop known to my generation and really reinforced the dangerous nature of those types of missions. Another fascinating part of that series was the training and transforming of those men into paratroopers to prepare them to make that fateful jump. In the decades since that jump, not a ton has changed in the training. Sure, the equipment has improved; though not exactly the same, it still follows the same basic pattern. That includes using three of the four 250-foot jump towers at Ft. Benning where the training continues to take place. To read the full article and see more videos and images please visit NYCAviation.com. This picture sums up most of the flying that we did at AMATS. Tilt the screen to line up the horizon and it will blow your mind. I had the great opportunity to go out to Reno, Nevada for a mountain flying course that really opened my eyes to the challenges of flying in a mountain environment. I felt like I had a little perspective having spent four months flying in the mountains of Afghanistan, but this course gave me a whole new perspective on what mountain flying can be like. 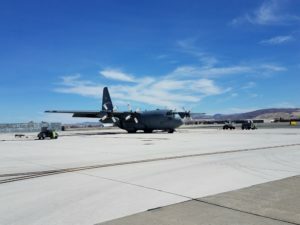 The Advanced Mountain Airlift Tactics School (AMATS) is put on by the 192nd Airlift Squadron which is part of the Nevada Air National Guard based out of the Reno-Tahoe International Airport. 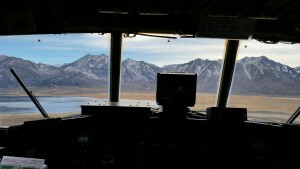 It is designed give C-130 operators an introduction to mountain flying, which has certain inherent dangers that are not present in less topographically diverse terrain. The course is designed to have one day of academics and three days of flying, but weather (an incredibly important aspect of mountain flying) prevented us from getting the third day in. From an academic standpoint, topics like weather, previous accidents, and proper mission planning were covered in-depth. This information was then applied to the actual missions that we would be flying in the coming days. This is the mountain we climbed over during our “zoom climb”. Imagine flying right for that mountain and then initiating the climb only a couple of miles before you get there. You can see the low-point on the ridge we aimed for. The first day of flying focused on flying through narrow canyons where one can get easily confused by which canyon you are flying as well as navigating through less defined terrain. After a short transit to the training area, we executed a penetration descent (essentially pitching the nose over and descending at maximum rate) then leveled off for a relatively standard landing at an out base. The first real part of the training is what’s called a zoom climb. Essentially you fly straight for a mountain at a high-speed and then pitch up and climb about 2000-2500′ in a matter of 20 seconds or so. Now that is nothing for a fighter, but to see a Herc climb like that, even for a short period of time is pretty awesome. The next phase of the mission was very reliant on proper mission planning. One of the challenges of flying in mountain valleys is that it is really easy to fly up the wrong valley and put yourself in a terrible bind. Through proper mission planning you analyze the terrain to find key markers that will aid you in flying up the right valleys and avoiding dangerous terrain like box canyons that you may have no way of getting out of. My sincerest apologies that I was without GoPro for this part of day one because it was incredible to experience. Dropping in over the lake on our way to the second airdrop of the day. Formation flying is so much fun. After winding our way through the mountain valleys we exited by way of our first ridge crossing, though nothing compared to what came on day two. After dropping our heavy equipment at the drop zone we switched positions with our wingman and they led us out on the second route which was much more wide open and presented a slightly different challenge. When terrain is really wide open there are two potential challenges. The first is the lack of ground references to verify your position throughout the route. This often forces you to utilize your navigation system a little more to ensure you are hitting your turnpoints and getting to where you need to be. The other challenge is that open, gradually climbing terrain can easily sneak up on you if you aren’t careful. We generally fly our routes between 300-500 feet AGL and as we crossed these wide open areas it was interesting to see how often our AGL altitude would drop without us even noticing. We never got too close to the ground, but seeing us creep towards the slowly climbing terrain was eye-opening. It’s not hard to get up for work in the morning when you get to look forward to flying this beauty. This route was also a great opportunity to witness a little hidden terrain. What this means is that smaller hills can get hidden when they have taller terrain behind them. There are more factors involved than just size, but the real danger here comes when you think you are farther away from terrain than you actually are. In a worst case scenario this could lead you to not climb early enough with catastrophic results. After passing the second area of hidden terrain we then climbed up a steep valley for our second ridge crossing of the day dropping down over a lake and into the drop zone for a standard CDS drop, and a recovery back to the airport. While not an incredibly cool shot of the plane, look at those clouds behind it. Weather in the mountains is unpredictable and excitingly dangerous. All of the videos on this post came from day two which was equally as impressive as day one. I should add that the grandeur of these mountains towering well above 10,000 feet was jaw-dropping beauty for our crew that is used to flying in Arkansas where our highest terrain is only around 2000 feet. 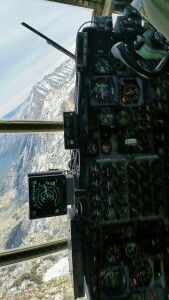 If you ever get the opportunity to fly in the beautiful Sierra Nevada mountains I strongly suggest it. Day two was focused on high altitude drop zones and landing zones. 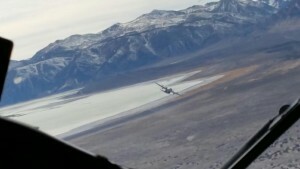 The first video above gives you a little glimpse of a formation takeoff and transiting to the training area. There are two important reasons this was included. The first is the weather. Look at the clouds as we fly towards the training area. The second reason is caused by the weather. Flying through such tall mountains can create some seriously drafty wind conditions. Add this to the fact that a huge storm was starting to blow in that would ultimately have 100 mph winds and drop four feet of snow and staying in position was serious work for the pilots. If you feel like the video is a little bouncy or jostled that is why. It can be a challenge to stay in position in calm conditions so add 30-40 knot winds and it is even more challenging. I give all the credit in the world to my pilots who kept as where we needed to be. The first part of this training involved a rapid descent through a gunsight valley into a high altitude drop zone followed by a rapid climb out the other side. The real challenge of a high altitude drop zone is that it takes longer for your plane to slow down to drop speed. On top of that we were descending into the drop zone which makes it almost impossible to slow down at all until you actually level off. 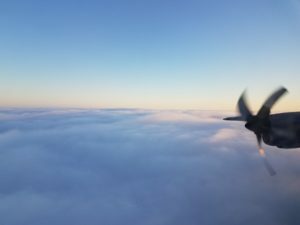 Once again, proper mission planning was necessary to ensure that our descent began on time, so that we would be leveled off in time, so that we could slow down in time, to drop our load on time. It was really cool to see how well the numbers we had planned worked out allowing us to get our drop off on time. It was equally awesome to see how well our climb out numbers worked on the other side of the drop taking us up and away from the rapidly rising terrain. The views were absolutely stunning, and something that the guys in Reno take a little bit for granted. At the top of this climb you can see us fly well above two good-sized lakes at about three minutes into the video. Those lakes would make a more prevalent appearance later in the mission. We then circled back around for another high-altitude drop without a hitch. The most exciting part of the day came after the second climb out up and over the mountains. To take us from our high altitude above the mountains down into the valleys for our next phase of training we would execute a ridge crossing. Initially, this was probably the most uncomfortable I got during all of this training. If you look closely in the video you can see the plane in front of us bank to the left way passed the ridge, and then we dropped over the top. The pilot banked the plane up to almost 60 degrees and the nose dropped quickly below the horizon. It honestly felt like we were headed right for the top of the ridge until we picked up speed and it carried us right past it. It was exhilarating to see such a large plane drop out of the air so fast. You can actually hear our instructor scream with excitement right as we cross the ridge. Shortly after that you can also hear the really loud sound of rushing air. That is the sound of the pressure release valve trying to keep up with the pressurization in the plane. It would end up taking another minute before the system would catch up after we leveled off. Once we got down to the valley floor we transited over to another ridge for a second ridge crossing into the valley where the landing zone was. While not quite as exhilarating as the first crossing it was still pretty awesome. The work at the landing zone provided many of the same challenges as the drop because the plane does not slow down as fast. My apologies that I only got two of the landings, but the battery died. The first landing in the video is at normal speed to give you an idea of what it looks like. The second landing was at 2x speed which is honestly more what it feels like. The added challenge of this landing zone is that there is rising terrain on three sides which means you have to slide in between the two ridges and then climb as quickly as possible after takeoff before turning for the next pattern. Flying back to the airport provided maybe the best example of how powerful the weather can be in mountainous terrain. We were flying at least a couple of thousand feet above the terrain but we still had a couple of sections of turbulence that caused us to lose at least 300 feet of altitude almost instantly. 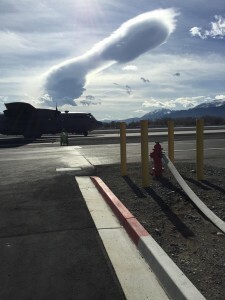 Mountain wave turbulence is some of the most dangerous weather you can experience in a plane because it is incredibly strong and can extend up to 200 miles away from the mountains that caused it. That means that you may not be expecting it. One of the biggest lessons I learned from this trip is just how important it can be to get good weather forecasts, and to truly understand how it can affect your operations. I think most of us are quick to understand the dangers of ice, thunderstorms, and the wind associated with it, but it is the clear air stuff that can really ruin your day. As I mentioned before our third day got weathered out because of the aforementioned mountain wave turbulence which was really an incredible disappointment because we would have been executing air drops on the side of mountains and up narrow valleys. Then we would have done dirt assault landings at high-altitude which would have been some awesome video, but what can you do? 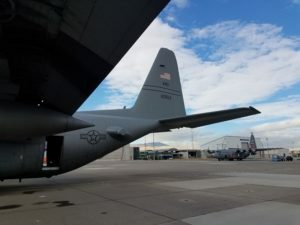 The AMATS course was the most worthwhile training I have gotten in the C-130. 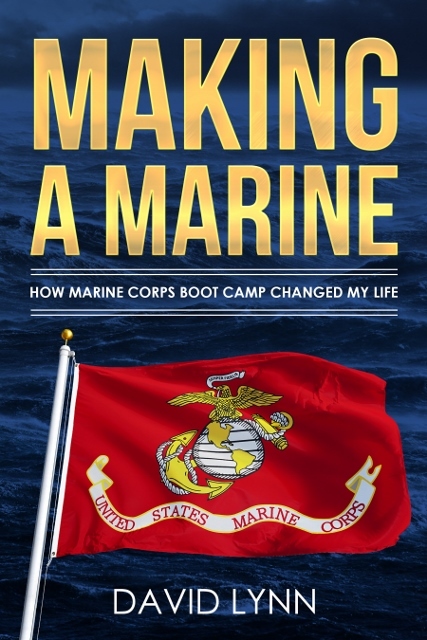 It was easy to see how everything they taught us could be applied in an operational environment. Even for the training that we perform on a regular basis there were key aspects that were taught. It really is a shame that this course is not more widely utilized because it will literally save the lives of the people who properly apply it into their missions. I gained a whole new respect for people who regularly fly in the mountains and the challenges that it includes. No matter how experienced you are the mountains can jump up and bite you, but taking advantage of training like this, either civilian or military, will go a long way to ensuring that you get to enjoy flying through the mountains and the wonder that they are. I’m working to get my stuff together from the awesome training I did last week, but while you wait for that I thought I would share this awesome video my cousin sent me on Facebook. It is incredible to see the handiwork that some people create. I love the touch of having the flyable Bell X-1 under the wing that they actually fly. So take a few minutes and enjoy this wonderful video. If the video doesn’t show up try clicking here. A friend of mine from work posted this on Facebook and I just had to share it. Great for a laugh these days. I think my favorite part is the beach/surfing at the end. We navigators really do live a glamorous life.